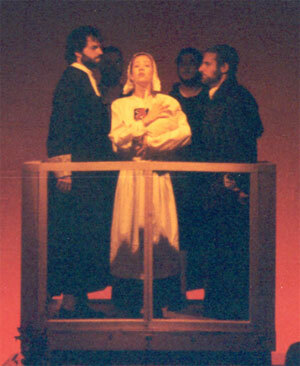 Production photos are from the 2001 World Premiere in Edinburgh, Scotland, produced by Blue Line Arts, Inc.
"Judgment Day" (sentencing of Hester Prynne), featuring Hester Prynne (Marisa Mickel), surrounded by (from left to right) Reverend Arthur Dimmesdale (Mark Sanders), Reverend Wilson (Zev Caplan), Governor Winthrop (Seth Kellam) and Governor Bellingham (Joshua Adler). 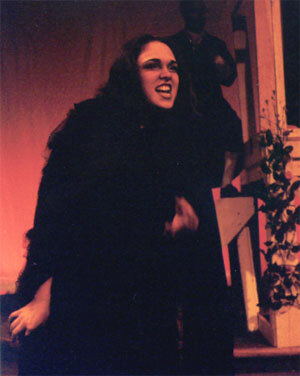 Suspected witch Mistress Hibbins (Vivienne Cleary) in 'Judgment Day." 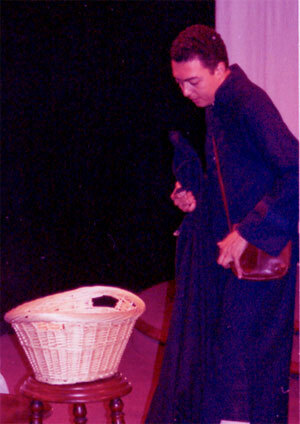 Roger Chillingworth, Hester's estranged husband (Graham Stevens) sings the lullabye ("The Interview") that names the infant child of Hester Prynne. 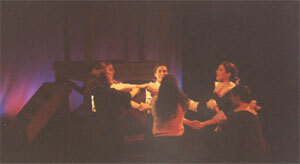 Townswomen (Rebecca Levy, Emily Ludmir, Lauren Popper, Molly Karlin and Kate Mulvihill) harass Hester Prynne's daughter Pearl (Kelly Miller) in "City Upon a Hill Montage." 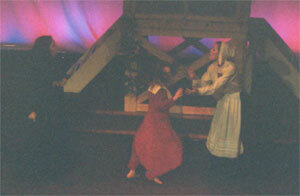 Town elders Reverend Wilson (Zev Caplan), Governor Winthrop (Joshua Adler) and Governor Bellingham (Seth Kellam) sing united as one with townspople (Molly Karlin, Emily Ludmir) in "City Upon a Hill Montage." 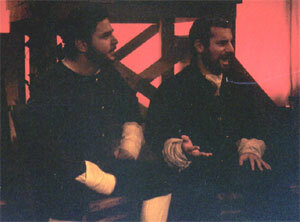 Governor Bellingham (Seth Kellam) and Governor Winthrop (Joshua Adler) debate taking away Hester's child in "The Governor's Hall.". 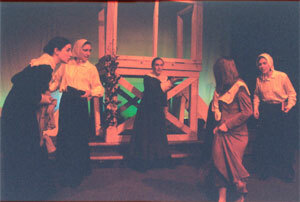 Mistress Hibbins (Vivienne Cleary) tempts Hester Prynne (Marisa Mickel) and Pearl (Kelly Miller) in "Come With Me." 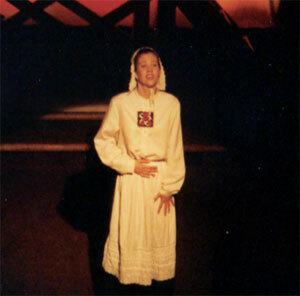 Hester Prynne (Marisa Mickel) in her stirring ballad, "Speak For Me." 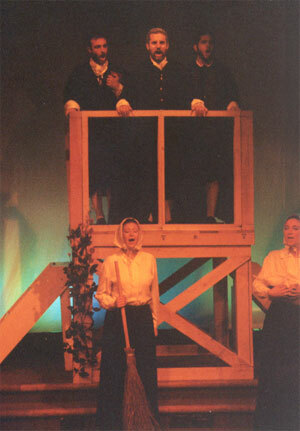 Witches unite in the forest in "Come With Me," the rousing opening of Act II. 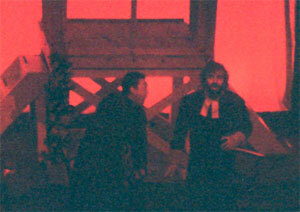 Roger Chillingworth (Graham Stevens) confronts the ailing Dimmesdale (Mark Sanders) in "Visions." 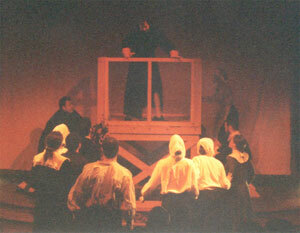 Redemption at last ... Dimmesdale (Mark Sanders) confesses his guilt to the company in "Election Day Sermon," the searing climax of the show.